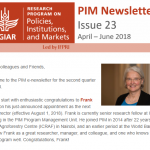 Collection of PIM news from the first quarter of 2019: new research, publications, PIM webinars, and more. 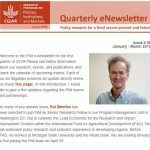 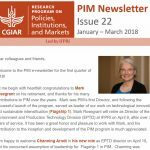 Summary of all new and important things that happened at PIM during the 3rd quarter 2018, including: the new program director, PIM webinars, publications, blogs, and updates from each of the research flagships under the Policies, Institutions, and Markets program. 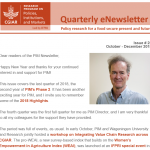 PIM research, events, and publications in the past three months. This issue features announcement of the new PIM director (effective August 1), videos with our researchers, our latest webinars, and a prominent media mention.